In a new twist, a team of researchers from the U.S. Naval Research Laboratory and the University of Texas at Austin has applied to acoustic waves the concept of "scattering cancellation," which has long been used to systematically cancel the dominant scattering modes of electromagnetic waves off objects. The work provides fundamental new tools to control acoustic scattering and should improve the ability to make acoustic measurements in the laboratory. It is described this week in the Journal of Applied Physics. "Scattering" occurs when an object has material properties different than those of the medium surrounding it, such as air or water, and its "mode" is characterized by the way waves bounce off of it. By applying a coating with the appropriate material properties, electromagnetic scattering modes can be cancelled—a process known as "scattering cancellation." It turns out that this applies equally well to other types of waves, such as acoustic waves. As the team reports this week, the principles of scattering aren't limited to electromagnetic waves but are a fundamental feature of how any type of wave interacts with its environment. "Scientists have spent many years studying mathematical solutions to discover how waves scatter from simple objects, such as spheres or cylinders. In most cases, they've attempted to solve the 'forward problem' to determine what the scattered field will look like for a particular object," says Matthew Guild, a National Research Council postdoctoral research associate at the U.S. Naval Research Laboratory. For scattering cancellation, a scattered field of zero is desirable, so the team set out "to explore the 'inverse problem' of determining which coating properties could provide this result," he said. "It's actually a bit tricky because there are so many possible solutions—most, however, aren't practical." A team at the Naval Research Laboratory previously focused on a particular set of solutions involving polydimethylsiloxane (PDMS)—a silicon-based organic polymer—to make coated objects "feel" as if they have the same properties as water. "These solutions are quite robust and can work for a wide range of conditions," Guild pointed out. The key significance of this work? It's the "formulation of a more general approach using acoustic scattering cancellation for complex, odd-shaped objects," said Guild. Previously, the approach was considered only for relatively simple shapes such as solid spheres and cylinders. "Using a coating that consists of two thin fluid layers, we theoretically demonstrated a significant reduction in scattering strength and confirmed it via 3-D finite element model (FEM) simulations," he explained. "To put the magnitude of this reduction into perspective, in air this is equivalent to going from the level of a 'two-person conversation' down to that of 'rustling leaves.' This effect works even when the coated object is placed next to other objects." Perhaps the most relevant implications of the team's work are its potential to improve acoustic laboratory measurements. "A fundamental principle of probing and investigating physical systems is that the measurement process can inherently disturb the system—sometimes referred to as 'the observer effect,'" noted Guild. At the quantum level, this is quantified by the well-known Heisenberg uncertainty principle. "While the uncertainty principle doesn't restrict macroscopic measurement devices, in practice there are many other real-world limits on the measurements of acoustic waves that can lead to a disruption of the sound field being investigated," he added. For acoustic systems, this sound field disruption can be minimized via a very small hydrophone. But "the electronics, cabling, and housing necessary to make the hydrophone work—and keep it protected from the environment—are often quite large and can significantly disrupt the field," Guild said. Scattering cancellation allows the scattered field outside of the coated object to be significantly reduced—without reducing the field on the interior. "This allows us to consider the potential of an ideal acoustic hydrophone, one that enables the measurement of sound in a laboratory setting without disturbing the acoustic field," he said. 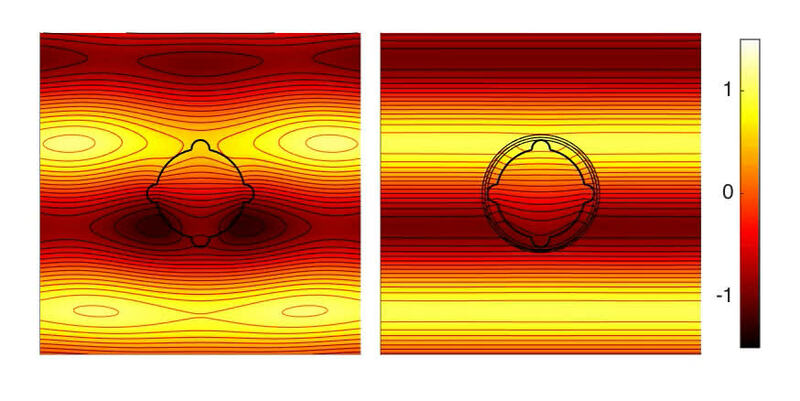 While the team's current work focuses on developing a more general acoustic scattering cancellation formulation using theoretical analysis and numerical simulation, their goal moving forward is to "experimentally verify these results" by building on acoustic scattering cancellation experiments demonstrated at the U.S. Naval Research Laboratory.